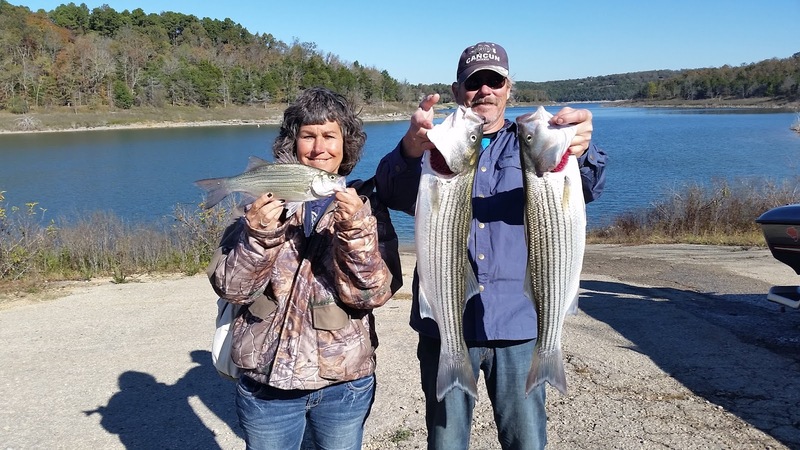 Norfork Lake striped bass, hybrid bass and white bass fishing is finally acting like it should for the fall fishing period. (About one month late due to abnormally warm water temperature) Over the last several days these species have moved out of the 30 - 40 foot water depth into 40 - 50 feet of water. The reason for this is that the bait has moved out to this depth range. I am finding large schools of fish on large flats from the 62 bridge area and heading up north. Look at the flat areas around the 101 bridge, Mallard Point, Cranfield area, Steward Point, and Briar Creek area. 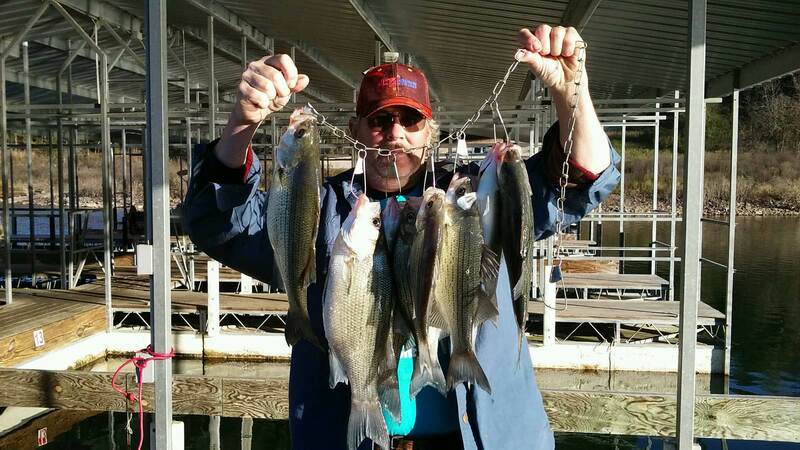 I haven't had time to check yet but the Robinson flat and the Fout area flats should also be holding some nice fish. The striped bass bite is still good up river on the Arkansas/Missouri border. These fish up river will stick around there until the water cools off. The fish will then take off to find water more in their comfort zone. I have mainly been vertical jigging a spoon, but trolling swim baits and umbrella rigs should work as long as you get the bait down in the 30 - 40 foot range. Live bait should also work set at 35 and 40 feet deep, but stay in the 45 - 55 foot water depth area. 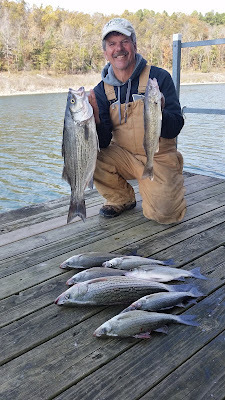 I haven't been out fishing after dark, but a few others have tried it and the stripers and the bait are not moving up to the shoreline at this time. Once the water cools off a little more and gets closer to 60 degrees I believe there will be a good night bite using suspending stick baits. I have not noticed any top water action for stripers yet, but it will happen any time now. Largemouth bass are at all depths at this time. 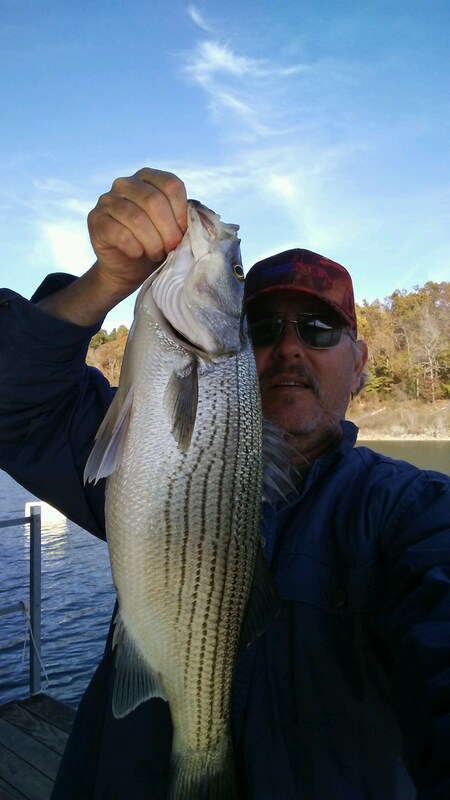 You can find fish up close to the banks, suspended along the bluffs and also out feeding in the same water depth as the stripers. Yesterday I jigged up 2 nice 3.5 pound largemouth bass in 50 feet of water on the bottom. I guess if you are a bass fisherman you have a lot of choices. 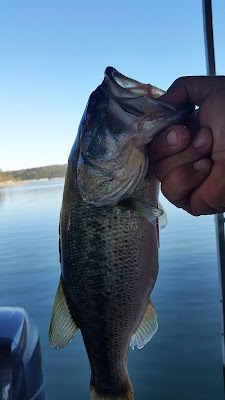 The top water bite for largemouth has been sporadic but I have found some nice fish surfacing in the morning around the bridge columns as well as on bluff line points. I am finding a few nice walleye in the same 45 - 50 foot water depth while fishing for stripers. You should also be able to find them near 40 feet deep brush as well as in shallower water on the flats early and late in the day. Crappie are on 30 - 40 feet. deep brush piles. But the best advice I can give is that after you catch a few on a brush pile the bite seems to stop. This is time to move to another brush pile and catch a few and them move on. They seem to spook easily in the cooler clearer water. You can return to a brush after you give it some time to rest. 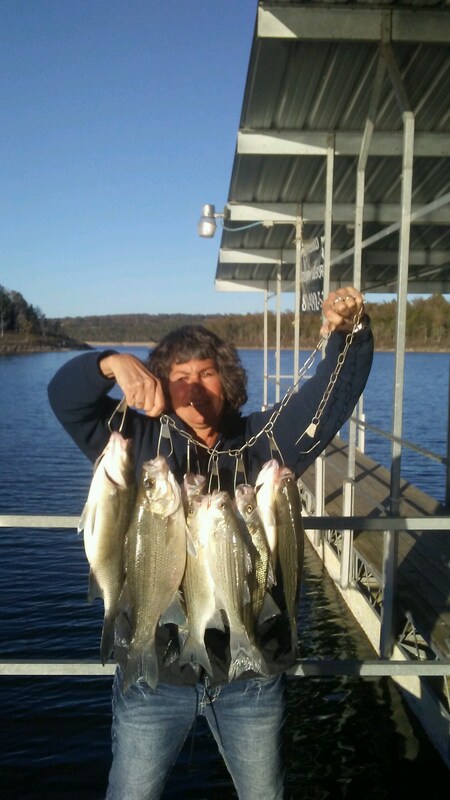 For daily fishing information and tips on Norfork Lake follow Hummingbird Hideaway Resort's Facebook page. Norfork Lake level is holding fairly stable and currently sits at 552.68. The water is cooling slowly and was 67 degrees this morning. The creeks, coves and part of the main lake are still stained and will stay this way until the lake finishes its turnover and cools off more.